This American Shingle-style home commands stunning views down a long, rolling green valley. The location and views were what drew the homeowners to this seven-acre Morris County site. An unsalvageable older home was torn down to make room for the new construction. 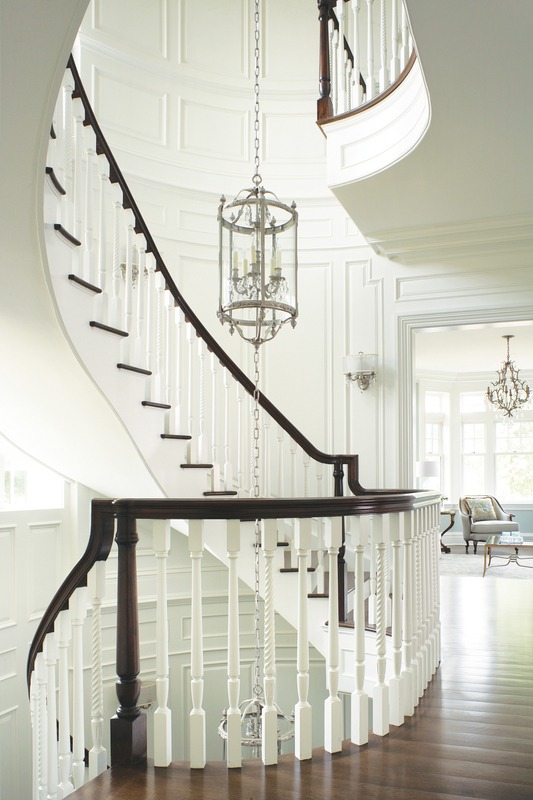 All of the moldings in the foyer of the home are custom and incorporate the feel of a Victorian home, architect Andrew Passacantando says. He adds that the Shingle style developed at the end of the Victorian period so the moldings lean more toward Victorian style than Colonial or Georgian. The moldings are in keeping with the homeowners’ desire for clean, elegant design. 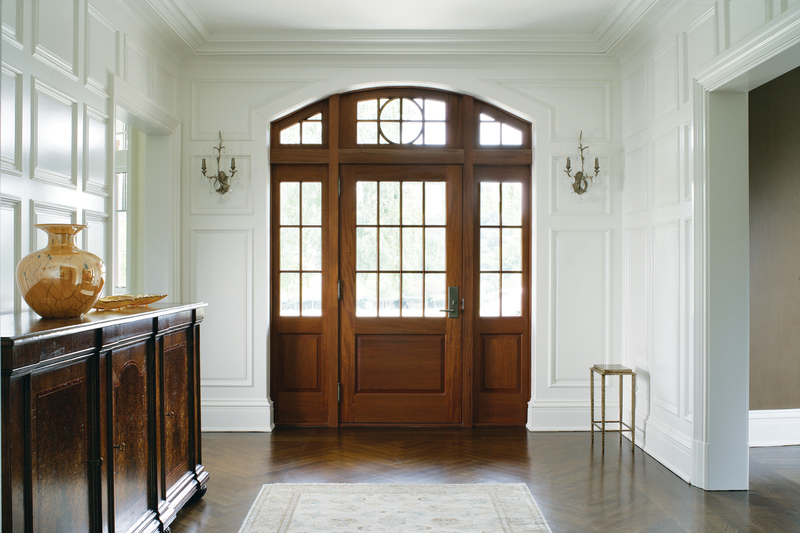 The custom wood front door is flanked by matching windowed side panels; all are topped by transoms. The handmade sideboard is distressed walnut with a rosewood inlay. The owners wanted a grand staircase, but they didn’t want it to be the first thing seen upon entering the home, Passacantando says. 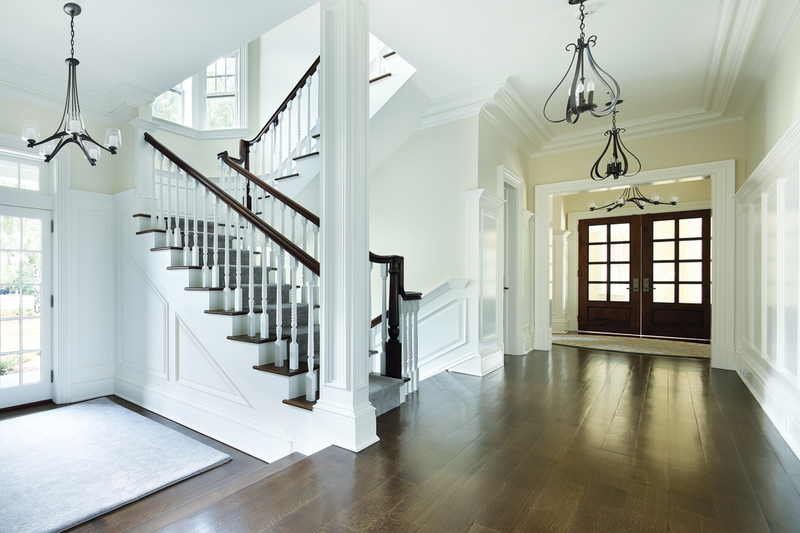 This staircase then—curved and running from the basement to the second floor—is located at the far right side of the foyer. Every fourth baluster is a turned style for a historical look. The French doors and wide expanse of windows in the family room at the back of the house offer views of the valley. The 10-foot coffered ceiling visually breaks up the space and makes it more livable, Passacantando says. It also allows for the discreet placement of speakers and pin lights to highlight artwork—a better option than having these more visible in a flat ceiling. The room has two seating areas featuring kid- and pet-friendly furnishings, interior designer Theresa Scelfo says. A beige chenille sofa sits in front of the fireplace opposite a pair of chairs in a golden brown hue; the chairs can be moved to accommodate different seating arrangements. Jack Wright designed the custom built-ins, with arches topped by pilasters flanking the fireplace. The ice blue, taupe and butter hues of the custom rug set the tone in the living room, Scelfo says. Two mirror-topped side tables with mahogany and antiqued gold bronze detailing sit on both sides of a linen-covered sofa. The cocktail table has an antiqued mirror top and an antiqued gold base. The living room, one step down from the foyer, has an 11-foot ceiling and a bay window. The kids’ great room features a custom walnut bar and French doors leading to a covered patio. The color palette is steel gray and grayish taupes. The fireplace is finished with the same stonework as the exterior chimney. The ceiling is an 11-foot-high white-painted coffer with a walnut-stained bead-board inlay; the floors are Turkish marble. The objective of the kitchen, which is open to the family room and the breakfast area, is to create multiple focal points, kitchen designer Peter Salerno says. The most obvious one is where the range and hearth align with the island, which runs parallel to the family room. 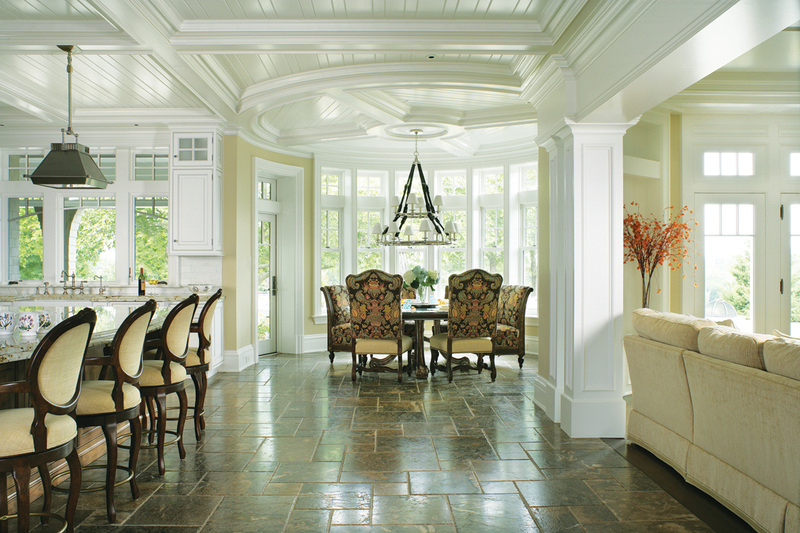 In addition, the ceiling molding echoes that of the family room. “Everything is in harmony,” Salerno says. The furniture-grade walnut cabinets are a raised-panel design with a hand-rubbed white finish. 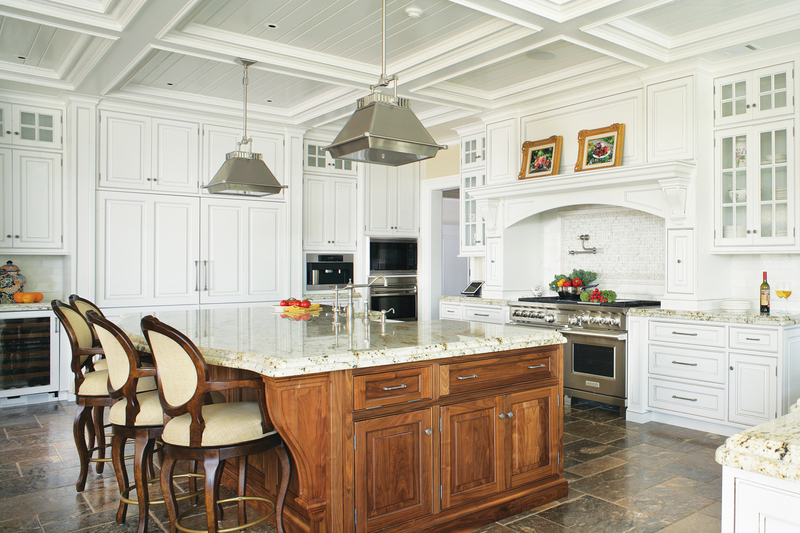 The island is stained walnut, and the countertops are granite. The backsplash behind the range is white mosaic tile with a pot-filler faucet. The flooring is Turkish limestone. Among other features are a built-in coffee/espresso machine and wine cooler and a walk-through food pantry. The breakfast area, adjacent to the kitchen, occupies a round tower. The door at left leads to a covered porch and views of the pool. The dining room has a coffered ceiling and, as Passacantando explains, “the coffer mirrors what’s below it, which is a long formal dining table. It works specifically for this arrangement of furniture.” Pin lights are set into the ceiling to provide mood lighting. The Italian-made custom table, a distressed walnut with intricate rosewood inlays, was hand rubbed, Scelfo says. The deep finish required two weeks of work. The arch at the left leads to the wine room and the one at right to the butler’s pantry. Walls have a strie/glaze faux finish in an olive brown tone. The wife’s office features a dramatic cathedral ceiling finished with a barrel shape. The floors are stained quarter-sawn white oak, and the paneled walls and trimwork are mahogany. 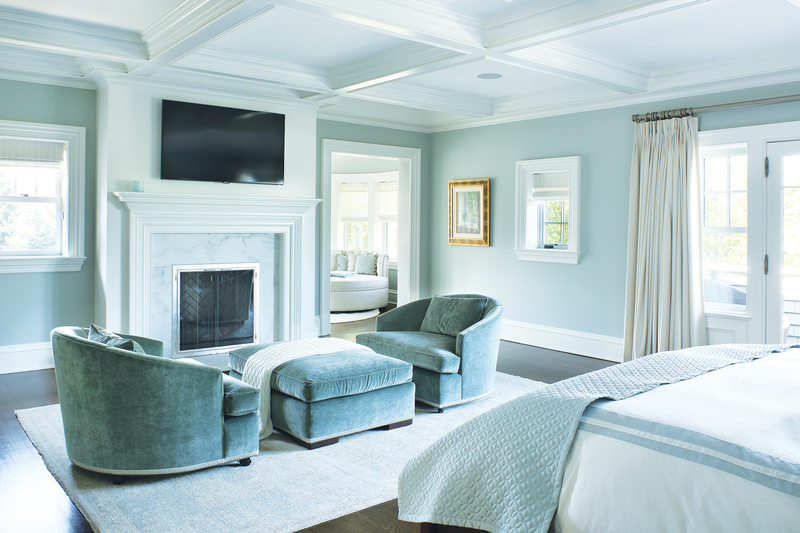 The serene master bedroom is done in a palette of ice blues and off-white. Velvet swivel chairs and an ottoman sit before a gas fireplace. The doorway leads to a sitting room. The gray blues and whites of the master bathroom were chosen to complement the master bedroom. His and hers dark wood vanities have mirrored fronts with inset curved wood detailing. 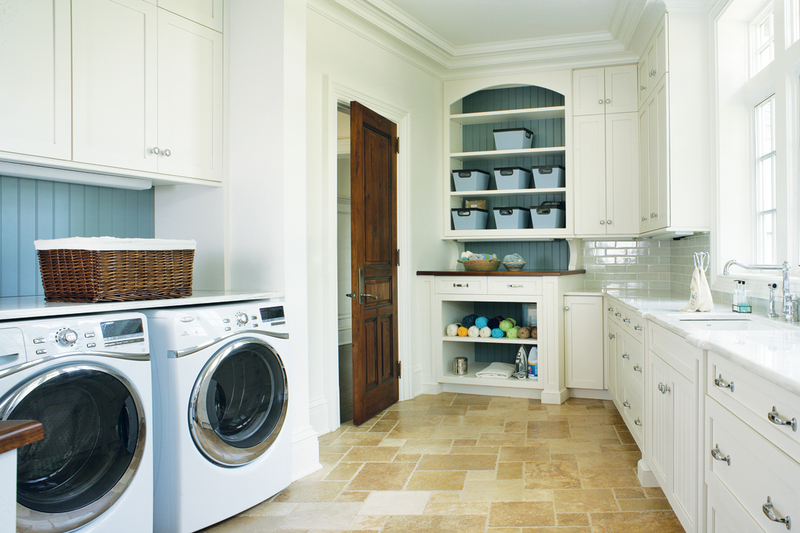 Cabinetry in the same design provides ample storage. At the center is a large soaking tub. 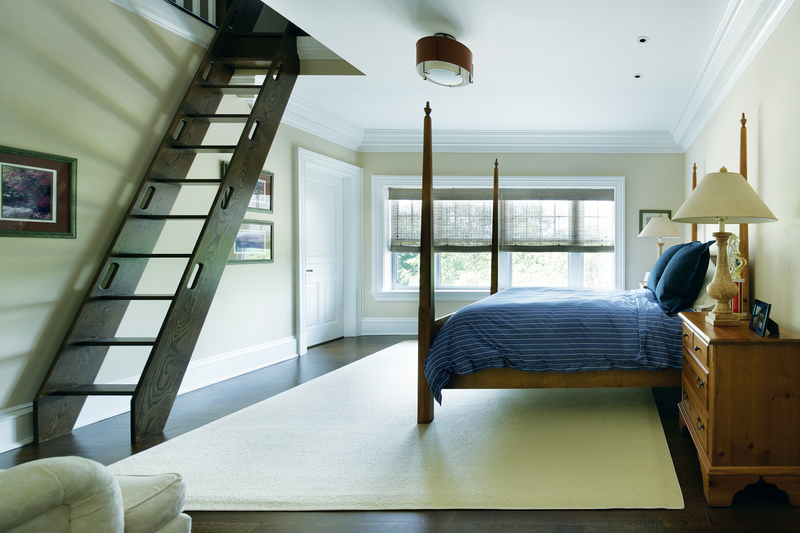 This clean and simple bedroom has a ladder-like stairway up to a reading nook with a dormer window that looks out over the valley. Nightstands flank a four-poster bed. The owners wanted something distinctive for each of their sons’ rooms. 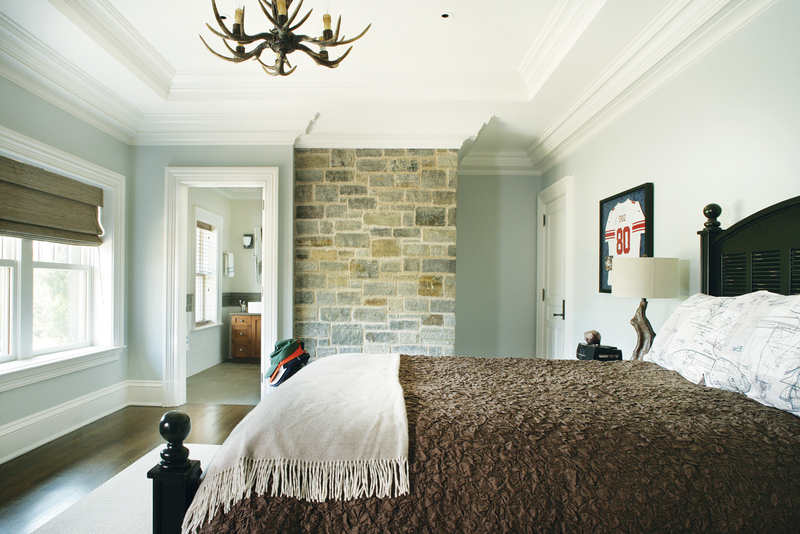 This bedroom has a stone wall that’s part of the home’s chimney, an antler-style chandelier and a natural-weave window treatment. The west side exterior of the house faces long-distance views. All of the home’s informal spaces (the family room, kitchen, kids’ great room and the office) are grouped on this side of the house to take advantage of the views, the architect says. The overall look is in keeping with the Shingle style. The roof is cedar shingle with horizontal details. The stone chimney flares at the base, mimicking the home’s flared-stone foundation. A covered porch with a bluestone patio provides a relaxing, shady area near the pool. The large roof overhangs create shade for the home’s wide expanses of glass and also protect the siding from the elements. A new home is designed to take advantage of the stunning views from its position at the crest of a hill. Situated on the crest of a hill, the back of the house looks down on a long, rolling lawn that descends into a valley. It’s a special location in a town where the homes typically sit at grade looking into trees, says architect Andrew Passacantando, a member of the American Institute of Architects and principal of Passacantando Architects in Morristown, NJ. The plan from the start was to build in the American Shingle style taking into consideration the views. The homeowners wanted “the relaxed look of that style,” he says. 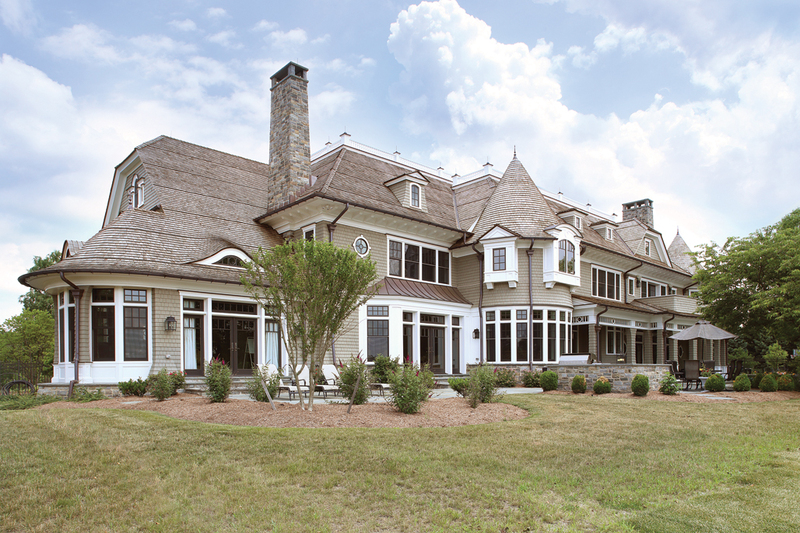 The Shingle style also offers “a more casual style of rooms and arrangement of windows” versus, for example, the rigid layout of a center-hall colonial, which was the style of the homeowners’ former home in town. “You can have big, open rooms­—an ideal layout for a young family with children,” he adds. Casual elegance was only part of the equation. “We wanted the house to be inviting, warm and comfortable. That’s hard to do sometimes with a large home,” she adds. A key factor in achieving that warmth and comfort is the wide range of interior details that went into the design of the home. Jack Wright of Flemington-based John Wright Designs developed many of these details, including the home’s coffered ceilings, paneled walls, crown and window details, wainscoting, built-ins, fireplaces and niches as well as the bar in the children’s great room and the library/wife’s office. “The structure [of the home] is a canvas,” Wright says. Among the challenges in a home of this size was to break up the hallways so they don’t appear to resemble railroad tracks running off in the distance. That meant, for instance, anchoring the hallways with windows at one end and a niche at the other. “You have to pick something that speaks to the sizes of the spaces and the sizes of the windows,” he adds. Interior designer Theresa Scelfo agrees that one of the challenges in designing a large home is how not to make it seem cavernous. “You have to have a consistent element from one room to the next,” says Scelfo, principal of Theresa Scelfo Designs LLC in Morristown. The interiors also were designed with an eye toward “cleaner lines and an up-to-date and fresh but timeless” look, Scelfo says. Another priority: meeting the homeowners’ charge for a kid- and dog-friendly house, what the designer calls “a usable house.” With that in mind, many durable, easy-to-clean fabrics were used throughout. Robin Amster, a frequent contributor to Design NJ, is a Madison-based editor and writer. Overall architecture, Passacantando Architects in Morristown; design services (coffered ceilings, paneled walls, crown and window details, wainscoting, built-ins, fireplaces, niches, bar in children’s great room, library/office), John Wright Designs in Flemington; interior design, Theresa Scelfo Designs LLC in Morristown; builder, George Strother, Eaglesite Management in Denville; lighting design, Robert Newell Lighting Design in Westfield; lighting design specialist, Howard Astrin of Luxe Lighting Studio in Fairfield; window treatments, Window Accents in Hillsborough; kitchen and laundry room design, Peter Salerno Inc. in Wyckoff; cabinetry in master bathroom, bar in great room, cabinet in office, wine room, Heartland Woodworks in Long Valley. Foyer: sideboard, David Michael Furniture in Lynchburg, Virginia. Family Room: all furniture, Century Furniture. Living Room: sofa, chairs, cocktail table, Oscar De La Renta for Century Furniture. Children’s Great Room: sofas, Century Furniture and Hickory Chair Pearson. Kitchen: countertops, Apex Marble & Granite in Cedar Grove; backsplash, Mediterranean Tile in Fairfield; flooring, Marmiro Stones in Carlstadt; appliances, Karl’s Appliance; range, microwave, wall oven, warming drawers, Wolf; refrigerator; wine refrigerator, Sub-Zero; dishwasher and coffee maker, Miele. Dining Room: dining table and chairs, David Michael Furniture; walls, Simply Splendid Faux in Hillsborough. Master Bedroom: swivel chairs and ottoman, Oscar de La Renta for Century. Master Bathroom: flooring, Marmiro Stones. Boys’ Bedrooms: furniture, homeowners.